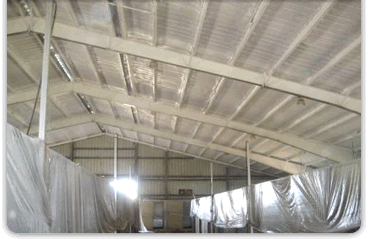 Spray polyurethane foam (SPF) provides superior insulation for agriculture, livestock and other animals. It is a practical, energy-efficient and safe way to keep plants and animals protected from the elements and extreme temperatures. By creating a seamless air seal, SPF insulation improves comfort, keeps buildings at the proper temperature and humidity, and reduces energy usage. Whether you are raising animals for sport, food or fiber, or you have temperature-sensitive crops, spray foam insulation enables you to provide the right environment. DFW Urethane has decades of experience spraying foam insulation in Texas and Oklahoma within a variety of agricultural settings. SPF is self-adhering and stays in place. It won’t sag, shred, fall off or create airborne particles. And, unlike conventional insulation, it doesn’t attract birds, insects or rodents. In open barns and stables, birds can dig or nest in fiberglass. This causes it to fall into stalls or pens, where it can be eaten by the animals and make them sick. Polyurethane foam is simply a higher-performing product. It lasts longer and provides better insulation. It offers superb control over both temperature and humidity. For this reason, foam is used almost exclusively in potato houses across the country. If a high-humidity environment is required in a specific area, such as a greenhouse or steam room, foam locks in needed moisture. When required by city code or desired, DFW Urethane will install an approved thermal barrier or ignition barrier over the foam installation. We also offer a white elastomeric rubber coating for aesthetic purposes. For unmatched expertise with foam insulation in Dallas, Fort Worth, Austin, San Antonio, Texas and Oklahoma, turn to the experts: DFW Urethane.